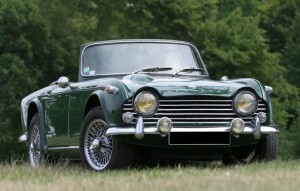 The Triumph TR4 and TR4a were both fitted with disc brakes at the front. To improve the performance of these brakes and bring them up to modern standards Fosseway Performance has developed a number of Triumph TR4 brake upgrade kits featuring our four piston lightweight alloy caliper and the option of a special 22 mm vented disc. As with all out brake upgrades the calipers maybe fitted without modification to the front suspension, steering or hydraulic system. All Fosseway Performance kits are supplied with stainless steel braided brake lines and EBC brake pads.